Well, the Unwell Crown came out I 2015, and it was a beast. People still use it until now but the Unwell Crown upgraded into two&three. Which is an obvious mean proves that the crown three might be better than the other two. This version is known the best because it produces a hell of a smoke and gives the best on the flavor. It is flexible with the airflow and produces the smoke one loves and is reliable. Moreover, it is a DTL vape. The coil can be used for 3 weeks maximum if the Watt is kept 50 or above it. If kept low, will not produce the smoke and not give a good taste for the flavor. It is said that the one of the most important things to break or make a vape tank is the quality it produces in the flavor, and this version works the best. Earlier said that the range between 50 above watt is amazing for the flavor as the airflow gets tighter and gives a great taste. Therefore, the Unwell Crown 3 is the best in the category of being reliable as mentioned earlier. This falls under the category of another well performed sub-ohm tank, which comes with an RBA deck (Rebuildable Atomizer Deck). The only reason for this RBA deck is that it does not have a pre-built coil and you may need this deck to build your own setup, which is suitable for TC. Compared to the Crown 3, it is very close to it in quality wise, produces amazing smoke, gives a fantastic taste of flavor and has no sort of leakage or anything. Coils last at least 2-3 weeks for this tank too. It is not difficult to fill the top fill system and the twist off. This is for DTL vapor too as it is just like the Crown 3 but just not amazing as it due to the RBA deck system. You are a sort of person who does not want to go above the 50 watts without killing the flavor, so for the above two might not really make you happy as both of them produce the best smoke about 50 watts and for that, you should try the Free Max Fire Luke Mesh Coils! This beauty produces the best quality of smoke with full flavor from 40 watts to 70 watts. This has a new design, mesh coil which is not like the standard wire-based coil that causes you to go above 50 watts to get a better result. Do not worry it does not leak or flood just like the other two. Has a much better quality for the long-lasting coils and is reliable just like any other FreeMax tank. It is counted as one of the best vape tanks in 2018 and is worth it for best result in flavor. As mentioned in the heading it is the best vape tank for flavor and is like THE VAPE TANK! This tank is built to bless your buds with a startling flavor. The best coil to is the 0.8-ohm coil for flavor, and works perfectly and is the best. Other than the best for flavor, this tank has other specialty and that is, it is hard to make it leak or break. It also has a system that makes it so easy for you to smoke without changing coils, you can just add more and it’ll do the work on its own. You are at the right place if you are looking for the best tank or just want the best flavor its possible with this pre-built vape tank… The Innokin Zenith! Now it’s time for the type of tank that produces the best blouds and is the best for chain vaping. This is known as mentioned above for the smoke it brings out if you’re really into making the room white within minutes or spend a whole day with it; then this one calls for it. Other than that it is free of leakage. The bad part about this tank is that it needs above 100 watts for the coil to give this result, and if you’re okay with that then oh well as it has some impressive clouds than any other tank. The variety of coil options are limited and the flavor is worse than the above. 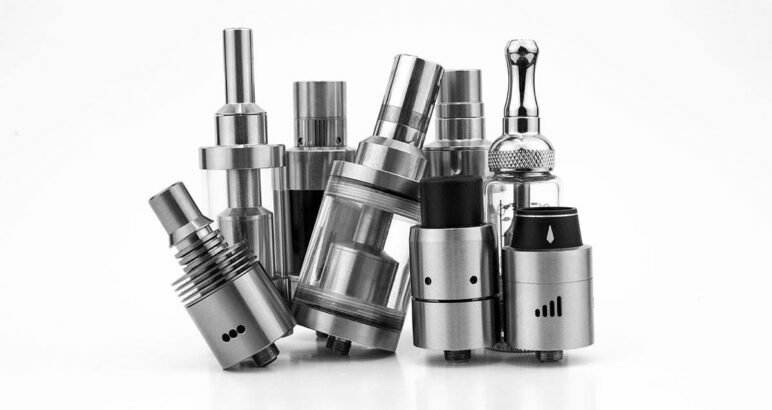 The Tank may lead the vape juice to demolish faster than another tank but depends on you. If you’re willing to go through this for the smoke then this fits the best for you. You cannot expect too much that makes it sensible for the machine that has a powerful cloud-producing machine. This Squid Industries, is easy to use, easy to refill and has no leakage issues but the awesome part is that it has got a very small tank, you can carry anywhere with you. Their motive of making such a tank was to represent the American culture that signifies their hard work, quality products, and reliability that is why it’s in the list of the best in 2018. Not a heavy tank but is portable and strong so it will not break too easily. Other best thing about this tank is that you can use different types of the coil with it and the airflow is adjustable. It may not be like other advanced tanks but it’s a simple one for a vaper who prefers a normal one giving you flavor and smoke that they can carry around all the time. This Squid industry has a kit with two different coils, a replacement glass, and o-rings. The kit itself comes with two different coils that will not burn out too quickly; you can just swap it and use the other coil if you want. With the coil, there is a replacement glass and o-rings. This is a big baby beast, is BIG and can hold the capacity up to 5 ml of E-liquid. It is better than their last version because of the size and the performance. It has a feature of locking the tank to protect it and prevent any leakage or splash back. Gives out a strong flavor and an enormous cloud production. It has the two openings at the base that are enhanced for the best possible airflow, the superlative part about this tank. Other than that it has a heat resistant feature. It is not too advanced as the other ones on the list but it has some quality’s that are similar to each other as it is easy to set up and fill back. It is not too bulky so you have to be careful with it, as it is fragile. The NRG tank has it’s own pro’s and con’s. It is big like the TFV8 and has similar features to it, what brought it to the list is that it is the best for the beginners. The additional things it has are the slide ‘n’ close top filter and a sort of web that helps with the splashback which also prevents you from inhaling it too. You can fill a lot of e-juice and it is not some rocket science to use like the others; talking about the coils, it can be customized with a wide range of pieces. It is crafted beautifully and has an adjustable base, which helps to control the airflow. The bad about this is the coils, they can easily cause to leak if they are not properly attached! It holds a modest amount of juice, maxing out at about 4ml. It seals up nicely with a threaded top-filling gasket that keeps the tank from leaking. It has excellent airflow, featuring three slots around the base rather than the more typical two slots. Its “Clapton structure” wicking apparatus optimizes the flow of juice to the wick, helping get the full potential out of the high-wattage coil heating it up. This Cascade Tank is a standout and deserves to be on the top list of all. The tank has many new features that make it better than the others do. For instance, like the isolation structure that separates the coil from the juice chambers. This feature prevents the leakage, gives you a fresh outcome on every puff and is cleaner. The base has three slots that make it easier for the airflow as you can alter it by giving more power or cooling. Other than that, it comes with an adapter that plays as a substitute for the coils. This tank comes in different colors, has a shiny design, and has a 7ml capacity. The only sad part about it is, it is not as portable as it is not too big but big.